We got a great crowd of around 20 people for our Drupal ‘Birds of a Feather’. The above is a shot of everybody in the BIGWIG Bloggers’ room — just before we got kicked out by some group from YALSA (bums, we’ll get even)! First up on the agenda was setting up the Drupal IG, making sure we have enough signatures and asking for volunteers to serve as Chair and Co-Chair. For the first year, Leo Klein (i.e. me) graciously volunteered to serve as chair and Ian Chan as co-chair. The name for the IG is ‘Drupal4Lib’ and our purpose is “to promote the use and understanding of the content management system, Drupal, by libraries and librarians”. Next on the agenda was the true meat-and-potatoes of the BoF: shooting the breeze about Drupal and demonstrating a few sites we were working on. The group consisted of librarians at all levels of experience from expert to beginner. Some were shopping around for a CMS and hadn’t yet decided which one to choose. Some had already deployed Drupal in one way or another — if only locally on their laptop — and wanted to learn more about it. Jon Blackburn showed us the FSU Library site, Tracy Sutherland gave us a taste of the soon-to-be launched Amherst Library site (public mockups here…) , and finally, Co-Chair volunteer Ian Chen gave us a taste of his wonderful work from his portfolio site. Unfortunately my nifty little projector was suffering relocation fits and kept on shutting down. [Note to attendees: if you weren’t able to show us a site because of projector problems, please post them here]. All in all the surprising thing was how quickly the time went. I personally found the BoF extremely rewarding. There aren’t many opportunities to meet face-to-face with colleagues united by an interest or curiosity in Drupal. I really look forward to our next get-together — in Chicago? 2008 ala, BIGWIG, blog, bloggers, content, Drupal, Group, Interest, libraries, unt. permalink. Hi Leo, I’m not a member of LITA but I’m very happy to hear that the IG is coming along. The more mindshare the better! 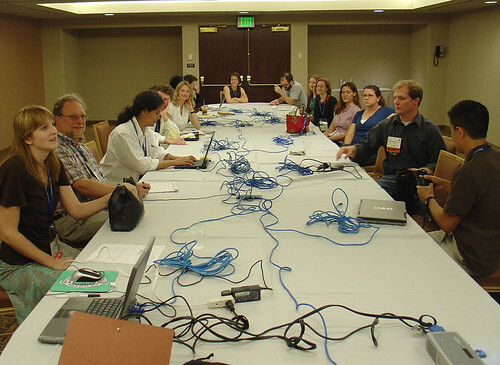 Pingback: LITA Blog » Blog Archive » Ideas for Drupal4Lib IG Event at ALA in Chicago? Hi ..i’ve been crawling over the net surfing fon Drupal & Library from http://groups.drupal.org/libraries …and everywhere. My problem is putting together how the library system works (i am not a librarian) … I know drupal though. Several modules avilable, but can’t find a good blog/info how putting together these module, actually being used in Library environment.